Time to ride! The FZ6R offers features that make it easy for riders to get started: a low seat height, grips that reach back to you, and a torque, 600 cubic centimeter engine you won't outgrow anytime soon. Add a beautiful diamond-steel frame, a sleek fairing, an R6-style exhaust and a price that makes it way more affordable than it looks, and it all adds up to the ultimate first sportbike. The meter panel gives the rider plenty of feedback, including a digital display speedometer, analog tachometer, odometer / tripmeter, fuel gauge, and water coolant gauge. FZ6R mounts tubeless radial tires on cast aluminum wheels. While their lightweight construction helps centralize mass, they also help contribute to agile handling. This bike boasts hydraulic disc brakes front and rear. The 298 mm diameter front discs are lightweight for reduced unsprung weight, while the single rear disc is 245 mm, and the brakes feature semi-metallic pads. The brakes have been designed to offer great feel and superb braking ability. The rear suspension is lightweight and contributes to the mass centralization, and the mono-cross suspension provides excellent wheel travel, a full 5.1 inches. Superior road hugging performance has been achieved with optimally designed damping-force valves and oil channels. The front suspension has sturdy 41 mm inner tubes, matched to a die-cast aluminum upper triple clamp and forged-steel under bracket, providing superior cushioning performance and good front-end feel. Wheel travel is a generous 5.1 inches to help soak up those bumps in the road. The overall chassis rigidity has been designed to provide both excellent handling and all-day comfort. In order to further enhance the smoothness and comfort of the ride, the front-end dimensions a have been optimized, including a caster angle of 26 degree and trail of 103 mm, contributing a bike that has great steering feeling, making the bike even more of a pleasure to ride. The handlebar position can be adjusted 20 mm forward by rotating the handlebar clamps to fine-tune rider comfort. The seat has separate front and rear sections, and the rider’s seat features an innovative height adjustment mechanism. The seat can be set 20 mm – just over 3/4 of an inch – higher for taller riders, a change that can make a big difference on an all-day ride. 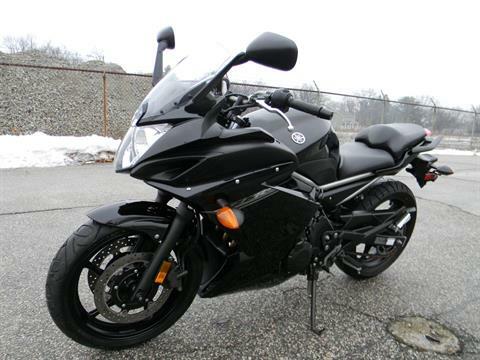 With its exciting sport bike looks, onlookers will know this isn’t just another middleweight bike. 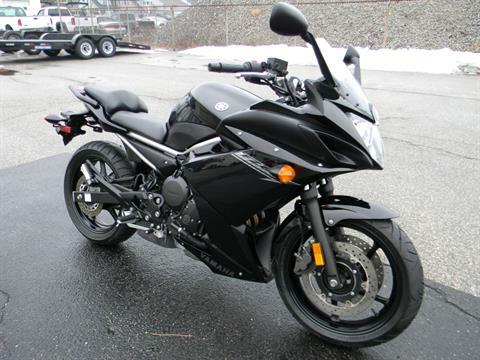 There’s no mistaking Yamaha’s high-performance heritage in the FZ6R. 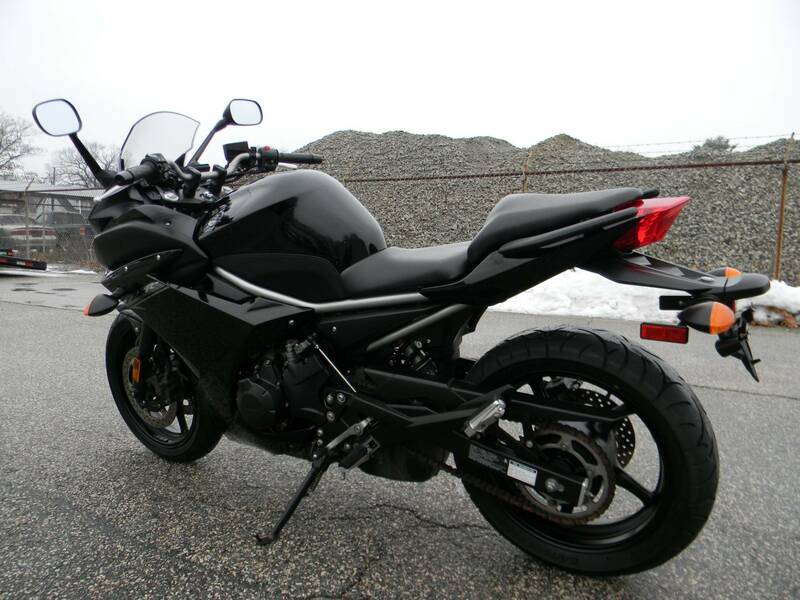 Much like many of today’s high end sport bikes, the FZ6R has a 4-into-2-into-1 midship exhaust. Not only does it provide a throaty, yet comfortably quiet exhaust note, the system also includes 3-way catalytic converter technology to reduce exhaust emissions. The 32-bit ECU controls the four-hole, two-direction, high-dynamic-range type fuel injectors for superior injection control. By delivering the precise fuel-air mixture needed for conditions, the engine can deliver great power and fuel economy. Lightweight forged aluminum pistons are used. Because the aluminum alloy is heated and formed under pressure without having to melt it completely as in conventional casting techniques, the strength of the original metallurgic matrix of the aluminum is maintained. As a result, a forged piston is stronger than a cast one and can thus be designed for lighter weight, which contributes to a reduction in vibration. In fact, many riders will be surprised at how smooth this motor is. The 600 cc liquid-cooled 4-stroke in-line 4-cylinder engine is ready to respond with smooth, linear performance when the rider twists the throttle. Maximum output is achieved at a spirited 10,000 rpm and maximum torque is obtained at 9,000 rpm. Bottom line: Its outstanding “torquey” low to mid rpm engine performance is just right for someone who enjoys commuting to work or school or riding the canyons on the weekends. The fuel-injected engine in the FZ6R has been designed to meet the demands of today’s motorcyclist. This engine optimizes the entire flow from the intake of the fuel-air mixture to combustion and exhaust. Even though it shares both bore and stroke dimensions with the FZ6, the cylinder head, crankcase, intake and exhaust system, as well as the clutch and shifter, were completely redesigned for the FZ6R, creating a power unit with an entirely different character. 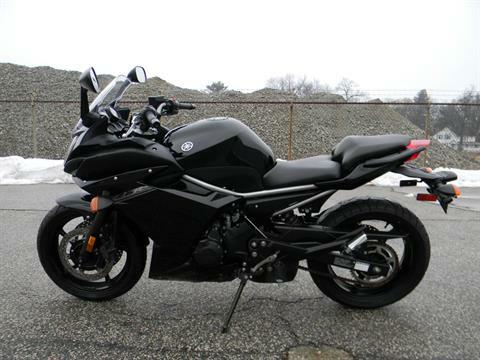 When it comes to putting power to the pavement, the FZ6R uses nothing less than quality radial tires, 120/70R-inch front and 160/60R 17-inch rear. And this bikes excellent stopping performance is due to the dual 298 mm front discs and 245 mm rear disc, both with comfortable-to-use controls. Even if your primary goal is commuting to school or work, you want to be able to get out and have fun riding some twisty back roads. 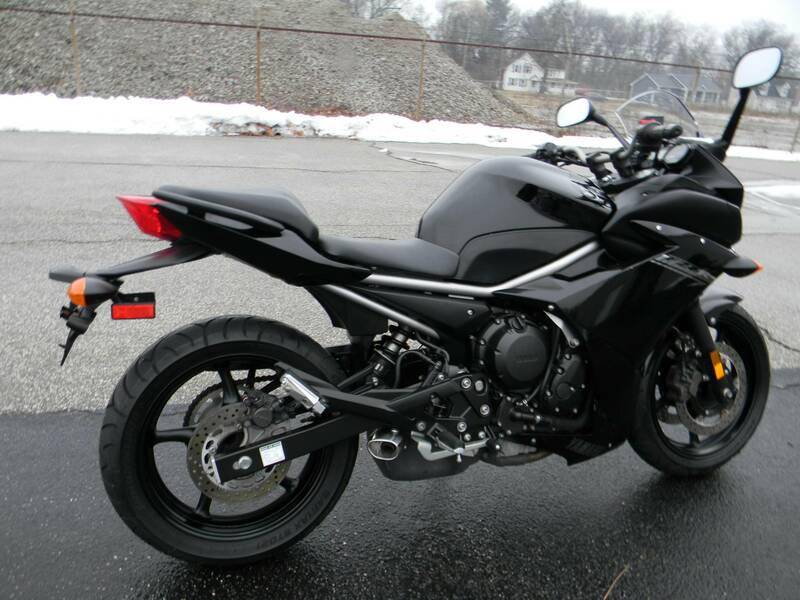 The FZ6R is ready to put a grin on your face! The diamond-shaped frame, made of high-tensile steel pipes using the engine as a structural member of the chassis, becomes the foundation for handling performance. It’s designed to provide the right rigidity balance to contribute to smooth cornering performance. The engine delivers smooth power just the way today’s rider needs it, brisk acceleration with plenty of torque that makes it a pleasure to get around town, with lots in reserve for when you want more. This is certainly not a “no frills” motor. Its derived from the FZ6 motor, fuel injected and tuned for outstanding low to mid engine performance. A rider in the market for an entry level or commuter 600 cc bike doesn’t have to compromise performance or style to get value. 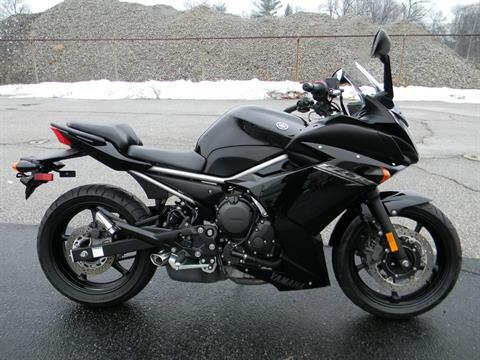 The FZ6R is a great combination of performance, handling, and exciting sport bike style, but also with a low seat height that’s both adjustable to fit a wider variety of riders and also narrower where it counts to make it even easier to put both feet on the ground.